I think the point was that he was hurt. Do you think he was 100% healthy in the playoffs? 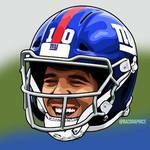 This debate will rage on until the Giants find their next franchise QB after Eli Manning is no longer with the team. The Giants took the Best Player Available. Hard to fault them on that, IMO. if the Giants are still looking for franchise QB in the next 3-5 years, than those who said the Giants made a mistake taking Barkley when they could've taken Darnold or one of the other QBs will be right. But until than, it is foolish to claim with 100% certainty that the Giants made a mistake taking Barkley instead of a QB. I dont know about 100% certainty, but after this season, Im about 95% sure it was the wrong move. I honestly would hate to have the same view of the NYG as you do. Im glad I disagree with almost everything youve typed on this board. No need to debate with me, I already know how it will end up. I think the point is running backs have a short shelf life. It looks like Gurley's days as an mvp candidate may be coming to an end. It's a shame. The Rams are already talking about bringing back CJ Anderson and using him and Gurley as a tandem next year. He can still run fast but may no longer be able to serve as a bell cow. This isn't a typical injury that you rehab and it goes away for good. The way i view the giants as a 40 + year fan and a season ticket holder, is realistically . That right now happens to be negative , as the team circumstances currently exist . I say your calling it a bit early. Your trying to forecast his career based off of a few playoff games. But I very well could see the rams pulling him back a bit in 19 and beyond. I think the giants with Barkley and the cowboys with Elliott should look to do something similar. When your offense relies heavily apon one player its scary. When you want to be a run first team a backup running back can play a huge role. Let's see if Gurley gets 300+ touches next year. If they use him they way it looks like they want to use him, he becomes another cautionary tale that running backs should be added as finishing pieces not foundational building blocks. Personally I think anyone who gives a running back a huge 2nd contract is out of their mind. In regards to a second contract, I think it should be a case by case basis. It is very possible to have a running back have success for 8 years or more. What - exactly - has Gettleman won? I was pro QB during last years draft. I thought for sure Darnold was the pick at 2. However, this can not be accurately answered yet. It’s still too early. Darnold is very young and looked pretty good the end of the year. His future looks bright. But if you look at the facts, Barkley is the better player right now. QB’s need more time to develop. This discussion needs to come back in another couple seasons. What if Darnold becomes a bust? Still a mistake? The bigger debate, at this time, should be Barkley or trade back? Giants probably could have went back a few spots and still got Barkley all while accumulating more picks. Yes, unless Allen, Rosen, and Jackson are all busts as well. You can't know that ahead of time. Six months ago, Gurley looked like the perfect candidate for a record breaking contract. I can't imagine a more worthy candidate. Now, that decision looks questionable. If you manage your roster based on risk assessment (e.g. New England), you'd never give a big guaranteed dollar deal to any running back in the middle of his career. There is too much relative risk involved. If you like to gamble like Jerry Reese or Dave Gettleman, sure, throw big money at your running back and cross your fingers. That's the problem with running backs. Once they're in their mid-20's, they have a hard time bouncing back from injury. They may come back for a season or two like Garrison Hearst or Adrian Peterson, but you don't often see a running back with leg problems bounce back to have a great 4-5 year run. We see more great RBs who are done by age 26 or 27 than any other position. I'm just glad they didn't pick ereck flowers or eli apple.